The Defence Line of Amsterdam was built between 1883 and 1920 to guard the capital Amsterdam. It is the only example of a fortification based on the control of water. The protection of the centre of the country was ensured by a network of 45 forts and their artillery acting in concert with temporary flooding from polders and an intricate system of canals and locks. For my visit to the Defense Line I chose Muiden and Pampus, two of the most accessible locations. Muiden is a historical fortress-town to the east of Amsterdam. The whole town is like an open air museum and has a real historical feel to it. The Muiden Castle is also a must. From Muiden I took the ferry to Pampus. This island became the final part of the Defense Line: it had to guard the entrance to Amsterdam via the IJ-river. Soldiers were trained here between the two World Wars, but never has the island been used in combat. The place was already outdated when its construction had finished. Nowadays Pampus sees 35.000 visitors a year. Since 1990 it has been privately owned by a foundation that wants to maintain and restore the fortress-island. They haven't been lucky in finding funds though, and so the site is in really bad repair. Not as bad however as when they acquired it twelve years ago, when there were rats everywhere and trees grew out of the buildings. I have visited this WHS in September 2016. 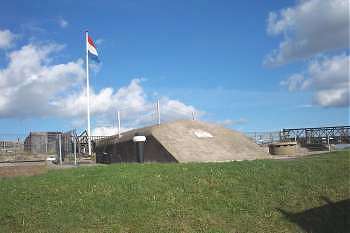 The Defence line of Amsterdam symbolises the engineering skills of the people from the Netherlands in water management. It also illustrates the spirit and atmosphere existing in Western Europe in the late 18th and early 19th centuries when most of countries were facing internal tensions as well as external pressures, increasing the likelihood of the occurence of a war and making necessary to all countries to erect defence lines and fortifications. 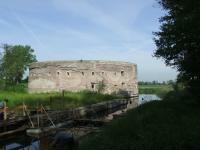 I have visited forts in Weesp, Muiden, Abcoude, Hinderdam and Nekkerweg. Other forts will come during my next trips to the Netherlands. 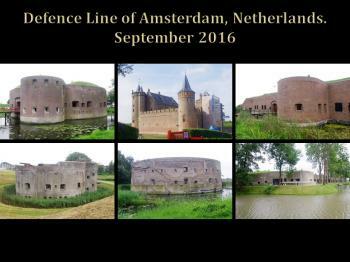 Because I had limited time in and around Amsterdam when visiting in 2014, I concentrated on a section of the Defense Line just outside Haarlem, which included Fort Liebrug and Fort Penningsveer. The walk to the forts was scenic, bypassing a recreation area on the west side of the Liede River. Both forts are on the east bank of the Liede. Fort Liebrug was closed, so I only got to see it from the road, but Fort Penningsveer was open on a Thursday afternoon in the summer. 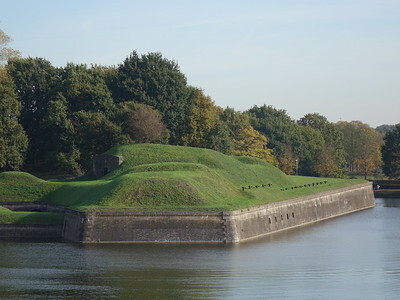 Fort Penningsveer is tree-covered and surrounded by a moat, and has several earth-covered bunkers and trails to explore. I encountered a youth camp unexpectedly on the back side of the fort, but I later found out on the Defence Line of Amsterdam website that the fort is being used for educational camps. The forts weren't the most breathtaking World Heritage Sites I've seen, but they were a pleasant way to spend a summer afternoon. Logistics: Train to Haarlem Spaarnwoude station (near Haarlem IKEA); walking path to the east bank of the Liede River to find both Fort Liebrug and Fort Penningsveer. Since I was in Essen, Germany, visiting the Zolverein WHS, on 17/12, I thought I would go to Amsterdam just for one night on 18/12 to attend a concert at the Gebouw for the first time. But because I had been to Amsterdam once before, instead of roaming the city before the concert, I thought I'd go check out another World Heritage site, the Amsterdam Defense Circle. It was a last minute decision, meaning I was not well-prepared. Once in Amsterdam I just walked into a tourist office, and a staff there recommended the city of Naarden to see part of the circle, showing me the impressive aerial photo of the city. So I went to Naarden, and it was fascinating to learn at the defense museum how the people in the low lands in Netherlands naturally came up with the idea of using water to defend themselves. But then after the concert in my hotel I checked the UNESCO website and started wondering if Naarden is really part of the WHS, despite the fact that a staff at the museum specifically told me that the whole town of Naarden was a part of that WHS. Because of my suspicion I quickly decided to visit the fortress at Weesp in the early next morning before my train departs from Amsterdam Central at 9 am. 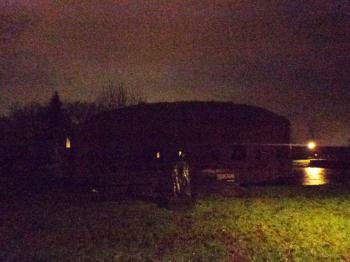 From the Weesp train station, I walked in the rain to the fortress at 7 am in the early morning winter darkness. By now I know that Naarden is not part of the WHS but is included in the tentative New Holland Waterline. This is a pretty interesting and unique site, but one that is a bit challenging to visit. It consists of over 30 separate sites within a 15 to 20-km radius around Amsterdam, all in various states of repair, with many not accessible to the public. The highlight is the small (artificial) island of Pampus in the IJsselmeer, which can be reached by ferry from Muiden. The military and civilian installations there are still very impressive and give a good idea of what life was like for the soldiers stationed there (it was only fully staffed during WW I). The guided tours seem to be in Dutch only, but you can get a map and walk around on your own. The pretty port city of Muiden has a nice maritime atmosphere and features, besides the interesting Muiden Castle, another part of the WHS - the Muizenfort, which includes some well-preserved trenches. The West Battery is directly opposite the castle and can be seen from the ferry (it would be a very long walk there). In the nearby town of Weesp (where the buses to Muiden leave), I went to see the Fort aan de Ossenmarkt, which looks quite impressive and well-preserved from the outside, but can't be visited. These sites are all southeast of Amsterdam and seem to be the ones that can be visited most easily. After my visit to Beemster (north of A'dam), I went to the nearby town of Edam, which is most famous for its cheese-making tradition. 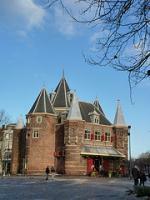 The Fort bij Edam can be reached in a (very) long walk from the centre. It is only open on selected days (first and second Sundays of each month from April to October, and afternoons only), because it is run and staffed by volunteers. It is not in a very good shape, but it was still interesting to walk around in the dark alleys and small exhibition rooms. Apart from Amsterdam's canal area, this was the most interesting WHS I have yet seen in the Netherlands. Aalsmeer fort - got a guided tour from the curator of the museum here, saw the facilities provided for the troops stationed here virtually undergound and enclosed in a massive reinforced concrete structure (train to Schiphol Airport then bus #198 to Aalsmeerdenbrug). 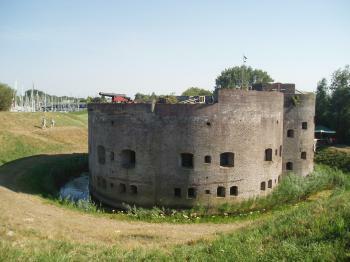 Fort Uitermeer - a circular fort (train to Weesp then bus #106 to Rondelvrugt. Muiden Slot - has more an appearance of a stately home or castle than a defence installation (by bus from Weesp). Pampus Island - the ferry ride from Muiden included an extensive guided tour of the fort. Amstelhoek fort - by bus #142 from Amsterdam Centraal to Tienboerenweg, Uithoorn. Fort an der Drecht - now a restaurant, winery and art studio (bus #170 from Uithoorn). Fort Vijfhuizen - now an art centre (by bus #140 from Uithoorn to Hoofddorp then bus #300). Fort Veldhuis and Fort an der Ham - found these on a hike along the dykes from Heemskerk (bus #167 from Beverwijk station) to Krommenie-Assendelft station. First I took the train from Amsterdam Central station to Weesp Station (+/- 15 min) and from there I took the bus to Muiden (stop brandweerkazerne: +/- 10 minutes). There I saw the complex of sluices, the westbattery, Muizenfort and I also visited the nicely preserved Muiderslot (which I can recommend taking some time for). Unfortunatly the boat to Pampus didn’t sail out this season, so I could only glimpse it from the shores of the Ijssel lake. The thing I liked most here was the west battery, I found it to be an intruiging structure. Unfortunatly I could only see it from outside, as the inside seems to be used for youth organisations. The muizenfort contains a museum, but this too was closed. Muiden is a nice town though with a nice maritime feel to it. And thank heavens for the zoom on my camera so I atleast had a decent picture of Pampus. I took the bus back to Weesp and had to walk about 1 km from the station to come across “Fort aan de Ossenmarkt”. A somewhat similar building to the westbattery in Muiden, though it seems to have stood the test of time in a better way. This fort is also not open to visitors and can only be viewed from the outside. After +/-15 minutes with the train I stood back in Amsterdam. The next day I took the train to Krommenie-Assendelft station (+/- 25 minutes, all trains are direct from Amsterdam). And I seem to come out in the middle of nowhere, along a seemingly major road. The station was quite modern though. From Google maps I knew I had to walk about 2 km. This had to be over the cycling facilities since they were no facilities for pedestrians. I had to admit, I didn’t feel quite safe, walking alone on that long road in what seemed the middle of nowhere (just a long road, some polders and town centres in the difference). Eventually I arrived at the fort (aan den Ham), you can see it from a distance, but the gates are closed. It opens up like once a month. Not the greatest thing I ever saw, though it’s considerably bigger then the ones in Muiden and Weesp. Back to Amsterdam with the train (the one I didn’t miss by a minute) and from there I took the train again to Haarlem-Spaarnwoude (+/- 13 minutes). When you’re nearing the station you can glimpse another fort from out the window of the train. The station (another modern one) is nearby an Ikea store and after walking over the huge parking area and following the map I had I came into a nature reserve (Spaarnwoude I believe it’s called). Which was a bit disorienting, especially since google maps seems to have troubles with such areas. Fortunatly 2 friendly Dutch ladies pointed out the right way for me. It seemed a much longer walk then Google indicated (1 km). I walked around the moat of the fort (Penningsveer), but all you saw was some trees, a hill and here and there some small manmade stuff. I reached the front, where some information signs stand and another closed gate. One of the signs reading you can book entrance. I admired the fortress from behind the gates (so you don’t see much) and turned back to the train station. I returned to Amsterdam, and went shopping with my friends. One should always make time for shopping ;-). The forts ring Amsterdam so if you travel about 15km out from the centre you will be pretty close to one of them. After a recommendation from Els we headed out to Muiden. There are two forts here as well as a ferry link to a third at Pampus. We first stopped at the Muiden fort near the lock at the centre of town. Having looked at the forts in aerial photos this was the classic shape of the majority of the forts, it is a sort of arrowhead shape surrounded by a moat. We had a look inside but most of the things were closed, there was information leaflets about the other forts along the New Holland Waterline (on the Dutch tentative list). We then walked out to the West battery (pictured), here you could get a better overview of the fort and its ring of water, it is now used as a meeting place for scouts. It was very hot so we went to the extremely small beach behind the battery and relaxed with the locals, looking out towards the fortress island of Pampus. Muiden was an exceedingly charming place to visit and the castle is very impressive, we had a lovely time here sitting in the café next to the lock watching the boats move past. It was worth making the short trip out, there are hourly buses to and from Amsterdam Amstelstation and it takes about 30 minutes. We saw three of the forts at Beemster, the one at Spijkerboor is open to visitors and has explanations about how the forts work, it was closed when we got there though. When you are taking off/landing at Schiphol keep an eye out as a fair few of the sites are located almost literally at the ends of the runways, I managed to see two more like this. It is quite hard to grasp entirely how these forts work, and as they are so disparate I never really got a full sense of their worth. The engineering is impressive and it is a distinctly Dutch interpretation of defence. As a casual tourist I wouldn’t suggest the sites themselves are really worth trekking out to see but are wide spread so a visit to many places just outside Amsterdam should give you a chance to view at least one of them. Reinforced Concrete: The invention of the brisance grenade (which would explode on impact of the target) necessitated the change from masonry to concrete forts. Linear inscriptions: The AB evaluation states "It may also be considered to be a linear Cultural Landscape, as defined in the Operational Guidelines (1995, paragraphs 35-39)". The full artifact is described thus :- "The defensive line of the Stelling van Amsterdam is roughly Circular, on a radius of approximately 15 km from the city centre, and extends over two provinces. The main defence line is c. 135 km long and comprises 45 forts, with a number of ancillary works." It is not absolutely clear however whether the inscribed area is linear or consists just of specific points -or a mixture. The AB eval states "The area proposed for inscription runs continuously in a 3-5 km wide zone from Edam, north of Amsterdam, to Muiden, to the east of the city, and out to the PamPuS island fort in the IJmeer, Passing through twenty-six municipalities. It includes forty-five forts and many smaller works." Polders: Several of the elements making up the site are related to Polders e.g "Engineers' dike through the Haarlemmermeer polder The large Haarlemmermeer polder was split into two by an engineers' dike about 15 kilometres from the centre of Amsterdam. Built between 1890 and 1895 it is 10.5 kilometres long and it allowed the southern half of the polder to be inundated while the remaining half stayed dry." 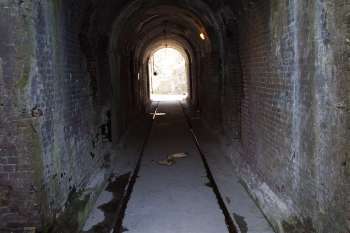 And "Fort near Hoofddorp In the middle of the Haarlemmermeer polder and the Engineers' dike, this fort was built between 1903 and 1904. Because of limited space and the depth of the polder, a two level bomb proof building was built with a deep moat and a special machine gun post to cover the deep moat." 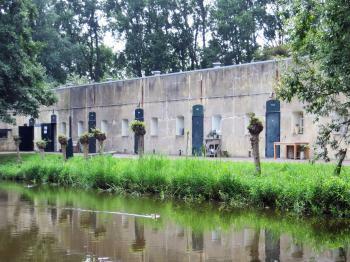 Exact locations inscribed twice (or more): Five forts and three sluices also belong to the Beemster Polder. 280 Community Members have visited.